March’s volunteer of the month has been awarded to Husna who volunteers her time each week to support our Diversity club. Husna has done extremely well in fitting straight into Diversity sessions. She has built up good relationships with the young people and has ounces of enthusiasm when delivering her art sessions. Husna strives to make tasks more accessible for the young people and has stepped in during her 1-1 shadowing time, when staff have needed support. Husna is reliable and friendly to young people and staff, and is a keen learner. When incidents arise in sessions, as they can when working around young people with additional needs, Husna does not panic, but rather assesses the situation and is hands on in the resolving process; whether it be comforting a young person, managing spills, or engaging young people in other activities. Husna has done really well to understand the young people, who all come from unique backgrounds and their own varied additional needs. Notably she has managed to get a young person who avoids art activities, to sit with her and draw something that he thought depicted his self identity. 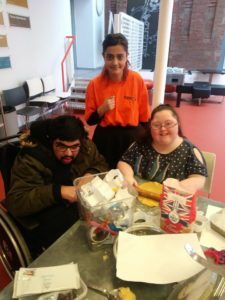 Husna had also managed to get a young person who enjoys coming into the art area regularly, to try his hand at baking as a change. Husna has shown great commitment and has progressed so much over the last 3 months. Her confidence has risen dramatically and she is building fantastic relationships with the staff and young people.